Adderall and headaches? You are not alone. Do you experience incessant headaches a few hours after you have taken Adderall? You are not alone. Adderall headaches are fairly common. Up to 26% of all Adderall users report that they get incessant headaches a few hours after taking the drug. Although a headache from Adderall does not pose any immediate threat to your life, it is an undesirable feeling that makes the drug counterproductive. A lot of people take Adderall to increase focus and concentration, and a headache is the opposite of this goal. Tension-type headache: A tension-type headache is a typical headache. It affects both sides of the head, and may bring a pressure feeling at the back of the eyes. This type of Adderall headache is not serious. It won’t prevent you from accomplishing your daily tasks. Migraine Headache: A migraine headache is an incessant throbbing headache that affects only one side of the head. If you get this type of a headache from Adderall, it will make you feel like throwing up. Chronic daily headache: If your headache lasts more than 24 hours, you might be experience a chronic daily headache. It is rare that Adderall will give you this kind of a headache, but if it does, seek medical advice. Cluster headache: A cluster headache is a type of headache that requires over a period of weeks. If you are suffering from a cluster, you’ll most probably experience one or two one-sided headaches over a period of 2-3 weeks. If you have been wondering how you can deal with Adderall and headaches, we have a solution for you. But first, let’s go back to the basics. Adderall, a combination of amphetamine and dextroamphetamine, is a strong nervous system stimulant. The medication is usually prescribed to ADHD and narcolepsy patients to help them fight hyperactivity. Unlike other smart drugs, Adderall is super-powerful. It has a chemical formula similar to that of meth and ecstasy. That should tell you something about its potency. Once the drug gets into your brain, it mimics the actions of adrenaline, norepinephrine, and dopamine, but in very high concentrations. The brain uses dopamine to send messages about rewards and pleasure, while epinephrine is used for fight-or-flight responses. Norepinephrine, on the other hand, is works to control all these neurons. Adderall boosts the functions of norepinephrine and dopamine in the brain, but with some serious side effects. Apart from the headaches, Adderall may also lead to seizures, heart attacks, sleeplessness and loss of appetite. The drug is also highly addictive and can lead to dependence. A lot of high school and college kids take Adderall in the hope that it can help them perform well in school. However, research has shown that Adderall has little help for students who do not have ADHD. If you do not have a doctor’s prescription, stay away from Adderall. 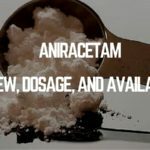 If you are looking for a nootropic or smart drug to help you concentrate on your studies, there are better alternatives to Adderall. All stimulant drugs can cause headaches when taken in high doses. Like cocaine, Adderall is classified under Central Nervous System Stimulant (CNS) drugs, and that’s why it causes incessant migraines. CNS drugs disturb the balance of chemicals in the brain. They may also release excessive stress-related chemicals, hence causing a headache. The imbalance of chemicals in the brain is triggers a migraine. Amphetamine induced hypertension is basically high blood pressure that is caused by the use of Amphetamines. Adderall, which is composed from amphetamine, activates the part of your nervous system that controls your fight-or-flight responses. These kinds of responses invariably increase your systolic blood pressure, heart-rate, and a few other cardiovascular functionalities such as heart contractility. Scientific study has found that use of recreational drugs including ecstasy, marijuana, cocaine, and amphetamines is a possible cause of reversible cerebral vasoconstriction. Since Adderall is an amphetamine, we can conclusively deduce that it, in fact, contributes to reversible cerebral vasoconstriction. The drug induces the release of norepinephrine, which is predisposed to narrow major blood vessels, leading to an Adderall headache. Ironically, some types of headaches are actually relieved by cerebral vasoconstriction. It is for this reason that you will find caffeine as an ingredient in many over the counter headache solutions. 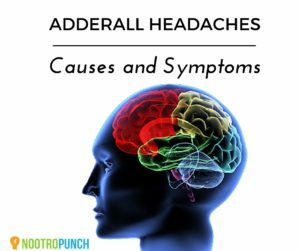 Persistent use of Adderall can cause massive electrolyte disturbances. All amphetamines, and by extension all other psychostimulants, are very powerful diuretics. They deplete certain solute resources such as sodium, potassium, and magnesium from your body. The depletion of sodium and potassium leads to conditions known as hyponatremia and hypokalemia, respectively. The resulting osmotic imbalance in the brain may result in incessant Adderall headaches. Additionally, when extracellular solute concentrations levels fall below the optimum level, water tends to diffuse into neurons (brain cells), making them to swell. This increases the pressure within the cranial vault, leading to a serious condition known as pseudotumor cerebri. Rebound headaches are a vicious cycle. When most people experience headaches from Adderall, they rush to their over-the-counter-drug supplier and get a quick pain killer. Pain relievers offer fast relief from headaches and migraines. However, when you take them more than a couple of days per week, they may trigger rebound headaches. Also, recall that Adderall causes headaches via vasoconstriction. However, vasodilation may also cause migraines. Once you withdraw from Adderall, the cranial blood vessels begin to dilate, leading to migraines. 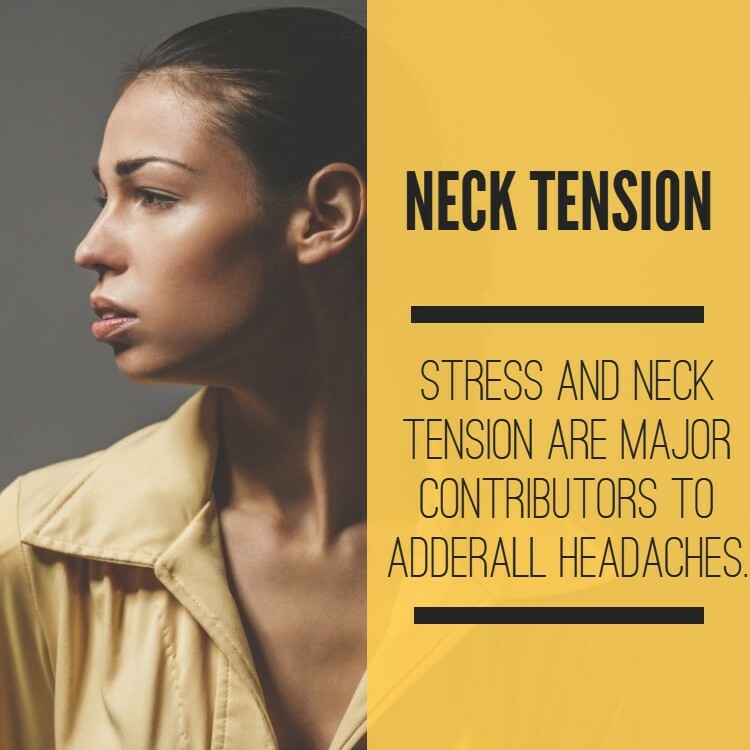 Stress and neck tension are major contributors to Adderall headaches. Recall that Adderall increases focus and concentration by enhancing the activity of norepinephrine and dopamine. Dopamine is one of the biochemicals that are involved in the regulation of muscles and movement. Hence, excessive dopaminergic signals in the body may result in muscle rigidity, which subsequently causes tension on your shoulders and neck, resulting in a headache. If the headache begins after an injury or strenuous exercise. NB: If headaches from Adderall are chronic, consider using one of the most popular Adderall alternatives. 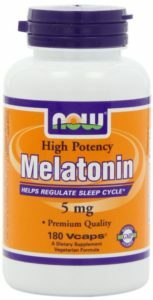 We personally recommend Modafinil (sold overseas by ModafinilCat). We recommend lifestyle changes as the best way of treating Adderall-related headaches. You should, especially learn how to properly cope with amphetamine crash. Immediate and unplanned withdrawal from Adderall might leave you feeling sluggish, irritable, and dizzy, and might make you relapse into drug use. Practice a few relaxation tactics to relieve muscle tension. Always relax your posture to reduce shoulder and neck strain. If possible, consider taking meditation sessions, self-hypnosis, and biofeedback. Limit the intake of sodium, cholesterol, alcohol and trans-fats to avoid Adderall-associated hypertension. Niacin (popularly known as Vitamin B3) dilates blood vessels. It may, therefore, reduce hypertension. Limit the amount of caffeine that you take, and quit smoking. Taking other psychostimulants when you are under Adderall will only exacerbate the headaches. Some supplements seem to reduce Adderall-related headaches. However, note that these suggestions are subjective. They are mainly from some of the other guys who use Adderall, and are not backed by any scientific evidence. Vitamin C- It promotes the clearance of Adderall from the nervous and blood systems. Ashwagandha- Reverses some of the negative effects of chronic stress. Phenibut- might not be the best long term solution for Adderall headaches, but it works. If supplements and lifestyle changes do not alleviate the headaches, you may want to try prescription medications. We recommend getting Propranolol, a beta-blocker medication that blocks adrenergic receptors, hence reducing hypertension. Apart from having the best cost-benefit ratio, Propranolol also has the best working mechanism. Beta receptor blockades counterbalance many of the harmful effects that Adderall impacts on your cardiovascular system. Non-steroidal anti-inflammatory drugs (NSAIDs). They include acetaminophen, ibuprofen, and aspirin. Anecdotal evidence suggests that NSAIDs may protect the brain from the toxic side effects of Adderall. Excedrin: (a combination acetaminophen, aspirin, and caffeine). It is mostly used as an abortive treatment for headaches. But be cautious when using this. Caffeine is a psychostimulant, and may worsen headaches. Antidepressants: selective serotonin reuptake inhibitors and Tricyclics (TCAs) can be used to curb repeated tension-type Adderall-induced headaches. Oxygen: Inhaling 100% undiluted oxygen using a face mask can be effective for curing cluster headaches. Glucocorticoids (Prednisone), triptans, and other calcium channel brokers can be effective headache preventive therapies. However, their effectiveness may be contradicted by concurrent Adderall use. To some people, an Adderall headache is not a big deal. To others, the pain might be paralysing. The advice given here is not professional medical advice and we advise you to talk to a qualified physician. Besides, remember to stay hydrated when you are taking Adderall. Eat well, and if for some reason you can’t eat, take a smoothie or yogurt.